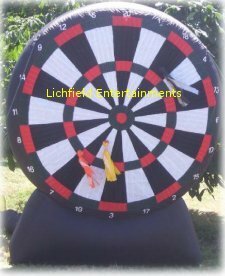 Giant Inflatable Darts Game Hire. Book the inflatable Giant Velcro Dart Game Today! Exactly the same as traditional darts only much, much, bigger - and the darts are velcro! This giant inflatable version of the game stands at just over 6ft wide and 8ft tall! Scoring is exactly the same the normal game. Ideal for fetes, parties, fundays, promotions, etc. If you're looking for our even larger Football Dartboard, that's over 24ft tall, click HERE. If you have any queries, questions, or would like to hire our Giant Darts game for your event please call us on the number below or click to enquire and we will do all we can to help.